What’s the deal with H → WW ? In a few days we will get the next big update from CERN on the Higgs boson and it is likely that the main question they are investigating will switch from “Is there a Higgs Boson?” to “Is it the standard model Higgs Boson?” Already the 2011 data shown during the winter carried signs that the cross-sections for some decay signatures are quite different from the standard model predictions. In particular the digamma rate is high and the WW is very low. Significance levels were not strong but if this is reinforced by the 2012 data people are going to suspect that new beyond-standard-model physics is at play. Many theory papers will be written as I predicted a year ago, but how well can the numbers be relied on? The ATLAS and CMS discuss many of the details behind closed doors and do not publish every detail. If theorists want to be sure that the results are good they will have to ask some probing questions at the talks. They need to go along to the conference prepared. 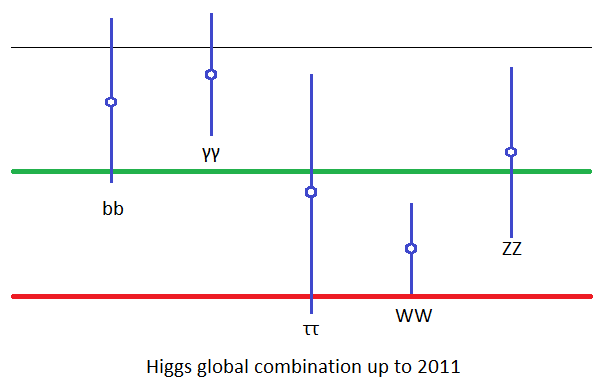 In this diagram the green line represents the prediction for a standard model Higgs while the red line is the background level with no Higgs. The first observation is that the Higgs is clearly favoured across the channels. After that, much has been said about the digamma excess because it is a high-resolution channel and an enhancement of this branching ratio could indicate new physics such as a new heavy charged boson. But what about the WW channel? It is now quite a bit below the standard model and is more consistent with no branching to WW. Even taking into account that these combinations are unofficial and approximate there is clearly something odd here. From a theoretical point of view this is very perplexing because the digamma decay is (in theory) dominated by loops involving the W boson. If the direct decay to WW is lower than predicted then the diphoton decay should be too. This really cannot be made sense of and if it is correct then the Higgs nature of the observed resonance would have to be questioned, but let’s not be too hasty. Errors from the measured standard model parameters such as the masses of the W,Z, top etc. All these things should have been taken into account and included in the error bars but before we draw too many conclusions and new theories we should ask questions, especially since the results do not make good theoretical sense. I think it is instructive to look at how the WW channel plot has evolved in ATLAS and CMS from the early days when they had 1/fb to the full 5/fb from last year. I’m not going to copy all the plots here but you can look at them on the Higgs combination plot. When there was only 1/fb of data we got excited because of an excess in the WW channel. It was most significant at about 144 GeV with over 3-sigmas but it was a broad excess which at the time suggested a Higgs in the range 135 ± 10 GeV, so with hindsight it was consistent with the present signal at 125 GeV. Sadly this signal faded as more data came in even though it was present in both CMS and ATLAS and is now nearly completely gone. What happened? Let’s walk through some of te possibilities. 2. and 3. Theoretical errors – The calculation of production rates is thought to be good to about 15%, but some theorists sat less and some more. The branching ratios are known to about 5%. Background estimates are another source of theoretical errors. Putting it altogether we may expect errors as high as 25% and it is not clear that this much error has been included in the analysis. This could eat into some of the significance of the observed deviations from the standard model. 4. Errors from the monte carlo – We have to assume that the monte carlo simulations have been run long enough so that statistical errors are sufficiently small to be negligible, but what about other errors. As far as I understand it, ATLAS and CMS have detailed simulators of their detectors that include everything from pile-up to the efficiency of the parts in the detector. One thing that could be very relevant is the effect of the pile-up. WW at low Higgs masses decays to leptons and neutrinos so there is missing energy to be accounted for. Pile-up has been said to make this difficult because particles from one event contaminate another. The simulations must include not just the pile-up but also the triggers and the algorithms used to reconstruct the individual events. How well has this been done? The first inverse femtobarn of data had low pile-up numbers so if they have not understood the effects of pile-up correctly it could account for the fact that the signal faded as high pile-up data was added. I dont know if this is a plausible explanation but it is something the collaborations should be talking about and if they don’t say anything about it theorists should be asking them questions. 5. measurement errors – From the 2011 data it was noticed that the CMS signal peak was at a lower mass than the ATLAS peak in the digamma channel. The difference was only about 1 or 2 GeV, well within the expected errors from the detectors, but this can still be significant. The WW channel has much lower mass resolution so how good is the estimate for the reconstructed Higgs mass? The reason that this is so important id that the WW branching ratio increases rapidly at around 125 GeV. If there are systematic errors that result in a mass offset they could be comparing experimental measurements with theoretical branching ratios and backgrounds at a slightly offset mass and this could result in big errors. For the digamma channel the problem is less acute because the branching ratio is a maximum at 125 GeV so it varies slowly in this region. the background also varies quite slowly. Another part of the measurement process that could affect the result is the resolution of the detectors. How well is this resolution understood for different parts of the detector? This effects how much the signal is spread out over different energy bins. If the resolution is better than expected there would be more events in the central bin than expected and the signal would be bigger than expected. The opposite happens if the resolution is worse than expected. How well have they taken this into account? The moral of this story is that if CMS and ATLAS do report significant deviations from the standard model next week, we as theorists should keep an element of skepticism in our interpretations. It ios easy to get excited by results that appear to agree with what we want to see, i.e. new physics rather than plain old standard model Higgs Boson. It will be impossible to resist speculating about what new physics can explain it and it will be a healthy excercise to do so, but don’t be surprised if more careful analysis sees some of the results fade away. We have become addicted to the beguiling green and yellow brazil-band plots that have been produced in hundreds to show where the Higgs does and does not show up, but as we move into the next stage of exploration at the electro-weak scale these need to be put to one side. What will count next is estimates for the mass of the Higgs and the actual cross sections for the different decay channels with error bars. The cross-sections need to be independent of the mass estimate so that we don’t get messed around by the ways these errors combine when branching ratios are varying rapidly, It may take a little longer before we can really be sure whether or not we are seeing the SM Higgs or a BSM Higgs. 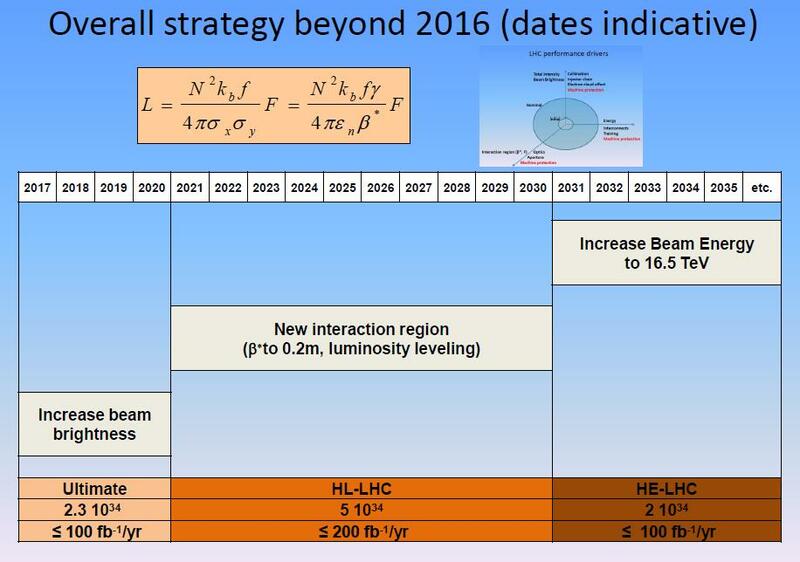 Reults from the LHC may improve as we head into the long-shutdown next year and we may need a linear collider to get really good measurements of the Higgs Boson properties. But meanwhile theorists imaginations may run wild. When people hear the price tag for big science experiments like the Large Hadron Collider or the Hubble Space Telescope they wonder what the benefits are that justify the cost. I am not talking about projects with obvious potential benefits such as a fusion reactor. This is about pure science, why is it worth doing? In fact there are lots of reasons so here is my list of the top 10, starting with the least important. 10 – spin-off innovations: When scientists are asked to justify why the LHC was worth building they often roll out the list of technical innovations that have been invented at CERN; MRI scanners, touch sensitive displays and of course the world wide web. NASA has an even longer list from non-stick pans to velcro. This only makes number ten on my list because I think most of them would have been invented by industry anyway. The advantage of inventing them at CERN or NASA is that they are not owned by private companies. What would the web be like if it has been invented by a computer or telecoms company? 9 – National Prestige: New scientific discoveries can make big news stories and for many countries there is a lot of pride in being able to call in their own experts who have worked on the project to give their summary of what it means. Politicians love it. 8 – Entertainment: TV documentaries, science magazines, blogs etc, they are there because many people find big science entertaining. 7 – Employment: Big science projects employ lots of people, another secret favorite of politicians. 6 – International Cooperation: This is rarely brought up but it is very important. Science is a very international business that brings together people from different countries. They tend to put aside national differences because what matters to them is the science. The relationships last and carry over into industry and even politics. 5 – The development of hi-tech industries: Building an experiment like the Large Hadron Collider requires new technologies such as superconductors, cryogenics and large-scale computing facilities. These are subcontracted to private companies that develop new methods with applications elsewhere. It is very hard to quantify the benefit that this brings but in economic terms it could be worth a lot more than the money spent on experiments that push the limits of technology. 4- Education: Places like CERN are packed with young people and the directors like to brag about it to the point of being openly ageist as employers. This is good news (unless you are over 30 and interested in ajob at CERN) because it means that these people are learning new skills and going on to use them elsewhere in industry or other educational centres. Students and graduates at CERN or NASA have to learn how to do research in physics, engineering and IT. In a world where science underpins the economies of developed countries it is an educational resource that no self-respecting nation can afford to miss out on if they want a prosperous future. Again this is rarely quantified but we hope that politicians who allocate the funds appreciate it. In my opinion it is the top practical reason for funding big science. 2 – Value for Money: When people quote the cost of something like the Large Hadron Collider in billions of dollars it certainly seems like a lot of money, but you have to remember that it is spread out over many years and many countries. The UK pays about £70 million per year for CERN. It is still a lot but it is a small part of the UK research budget and it brings all the above benefits. I have never seen a cost benefit analysis done on this basis but I bet it comes out as good value. 1 – For the Knowledge: It has to be the number one reason for doing pure science, because we want to know and should know the answers to big questions. It is just part of what makes us human. Tomorrow’s plenary sessions at the ICHEP conference are keenly awaited by particle physicists because of the rumoured possibility of some new physics results, but there is another reason for them to get excited. There will also be a lot of discussion about the future of particle accelerators. The day will open with a talk by Steve Meyers about the progress so far with the commissioning of the LHC. He will also talk about the long-term future in which we could see the LHC upgraded from its current design limit of 14 TeV energy to 31 TeV. There will also be possible improvements in luminosity that could see it producing 200 inverse femtobarns of data each year. Although that talk is tomorrow the slides are already up so you can get an idea of what he is going to say already. The slide below gives an overview of the plans taken from yesterdays talk “LHC Machine Upgrades” by Roger Bailey. After the talk by Meyers there will be a some reports of highlights so far from the LHC experiments. 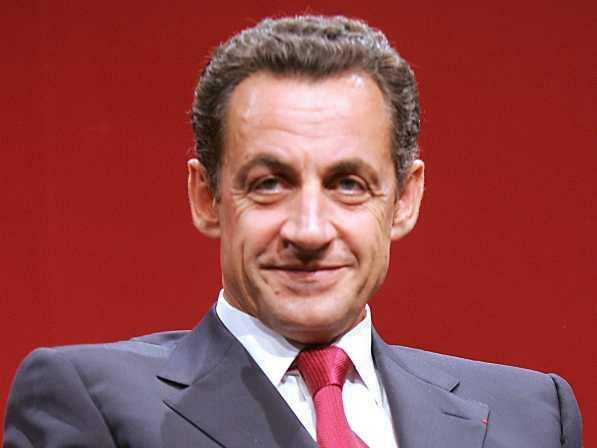 That will be followed by an address from Monsieur le Président de la République AKA Nicolaus Sarkozy and then there will be a press conference over the lunchtime break. Hopefully all this will be included in the webcast. It all seems like a lot of fuss to make over a physics conference so we hope this means that there will be some political announcement concerning the future of particle accelerators. After some more interesting physics talks in the afternoon that will include the much-anticipated “Higgs Searches at the Tevatron” by Ben Kilminster, the day will end with a couple of reports that includes one from the International Committee for Future Accelerators. Sadly they have not yet posted their slides so we can only guess what they have in store for us. The ILC (International Linear Collider) is the most talked about possibility for the next generation of collider. It will be an electron-positron collider like LEP, but unlike LEP it will be a linear design rather than a ring. The advantage of lepton colliders over hadron colliders is that leptons have no known structure so they give much cleaner results. A high energy electron positron collider would allow detailed measurements to be made of particles discovered at the LHC. The disadvantage is that it is hard to accelerate electrons up to the same energies as protons. because they are much lighter they need to be pushed to higher speeds so that the relativistic gamma factor generates more energy, but at higher velocity they radiate away energy much faster when they are circulated in a circle. For this reason a linear design is mor effective. The nominal design now under consideration will provide 500 GeV of centre-of-mass energy. That may seem a bit feeble compared to the energy of the Large Hadron Collider which is 14 times as much, but because leptons are not seen as composite at these energies, more of the energy will go into forming new particles than is normally possible with composite hadrons. Nevertheless, if they pick the ILC design now and then the LHC finds a new 600 GeV particle later this year, it will be a little frustrating. The alternative is to adopt a more ambitious design for a linear collider known as CLIC (Compact LInear Collider) which would use normal conducting cavities rather than superconducting cavities. This could allow it to reach energies of 3 TeV. The main issue with CLIC is that its feasibility has not yet been demonstrated. If they are going to make a definitive decision now, it probably wont be CLIC. 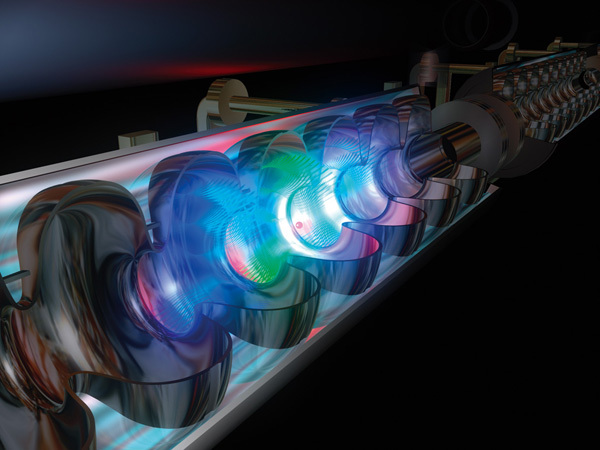 There are other alternatives such as the LHeC project which is a compromise that fires electrons at protons. This has some advantages of its own but it does not appear to be a leading contender as yet. The conclusion is straight forward. The only presently viable option for the next generation of colliders is the ILC. Tomorrow physicists may know more details about what their government sponsors have planned for them. Yesterday the rumour mill appeared to be slowing down when it became clear that a simple Higgs excess from combined Tevatron data was unlikely. Now it is spinning up again with a report on the Reference Frame pointing out that some plots for a Higgs+bottom signal have mysteriously not been presented yet. Once again we need to wait for the Tevatron talk on Monday which has been pushed back to about 16:30 due to the address by Sarkozy at noon. But is there something else going on? Why would a head of state turn up at a physics conference unless there is something news worthy about to happen? Perhaps he wants to be there when the God particle discovery is revealed to the world, but that does not really add up. The announcement can only come from a US lab and it is unlikely that the US would even alert the French president that something is to be announced. Another clue is an ICHEP press conference scheduled for 1pm, shortly after the presidential speech. This was scheduled before it was known that the president was dropping by. This could just be a routine press conference to say what a great time everyone has had at the conference but I think there must be a little more than that. Could the press conference be another clue that an important physics result is to be announced? Well, it will take place before any talks that could describe anything new. I don’t think that possibility is right. So who will be at the press conference? There will be Guy Wormser who chairs the ICHEP organization committee, Rolf Heuer who is the Director general of CERN, Mel Shochet who is chairman of HEPAP in the US and Atsuto Suzuki who is chairman of the International Committee for Future Accelerators. Are these people just dropping by to tell us that as representatives of experimental particle physics on three continents that they think ICHEP was great and they are looking forward to the next one, or do they have something specific to announce? Of course the rather obvious clue is that the three main people at the press conference are the international representatives for the US, Europe and Asia for committees looking at the future particle accelerators. Their appearance suggests that they are about to announce some news about an international initiative, such as the International Linear Collider. My guess is that a deal has been reached on funding for the ILC and it will be built at CERN, and Sarkozy will announce this in his short address. Update: There was no specific announcement about the ILC in the Sarkozy speech but he spoke extensively of French committment to funding for science in general and international projects for big physics in particular. You are currently browsing the archives for the International Linear Collider category.